It seems there are two places in Mongolia: Ulaanbaatar and the countryside. While the climate, terrain, and even culture differ wildly throughout this country, the division is apt. According to the 2010 Population and Housing Census of Mongolia about 1.8 of the nation’s 2.8 million people are living in urban areas. 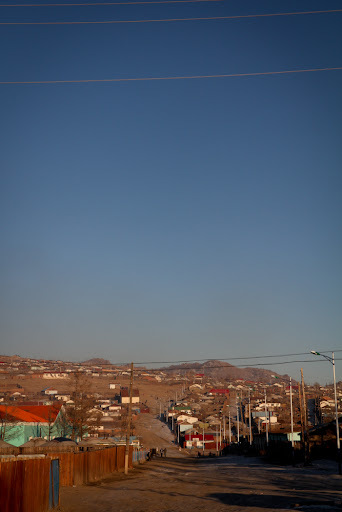 Around 1.5 million of those people are living in and around Ulaanbaatar (ten times more than the next biggest city). Additionally, Ulaanbaatar’s population density has grown to 246 people per square kilometer, a drastic difference when one considers the national average: 1.7 people per square kilometer. All this is to say, there is a significant difference between Ulaanbaatar and the rest of Mongolia. This past weekend, I finally had the opportunity to get out of the city for a few nights and into the other part of Mongolia. 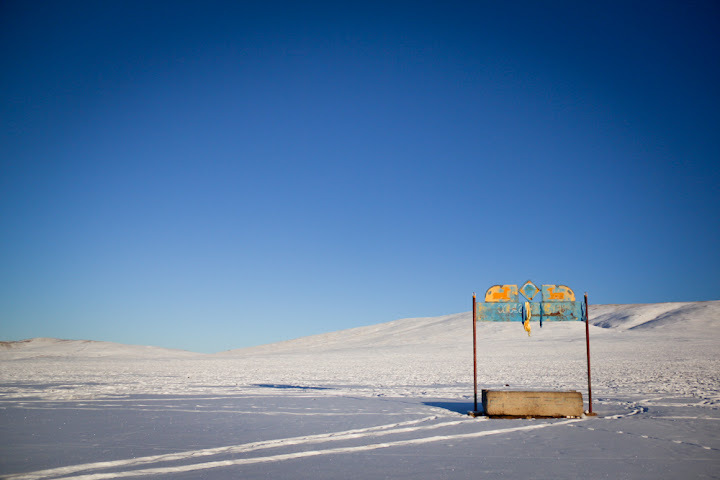 I traveled with my roommate to one of the central provinces: Arkhangai. I was tagging along on a work trip as a volunteer photog and videopgrapher for Mercy Corps, the development NGO she works with. But I still think I got the good end of the stick. We left Ulaanbaatar early on Sunday morning, escaping the morning pollution fog for the fresh country air. We weren’t 30 minutes outside of the city when I could already tell the difference in air quality. It’s amazing how humans can adjust to challenging living situations – but living in heavy air pollution is one I hope I am never fully comfortable with. I had been on the very same road leaving town five years ago, but now with four inches of snow covering the steppe and slight mountains, it looked completely different. 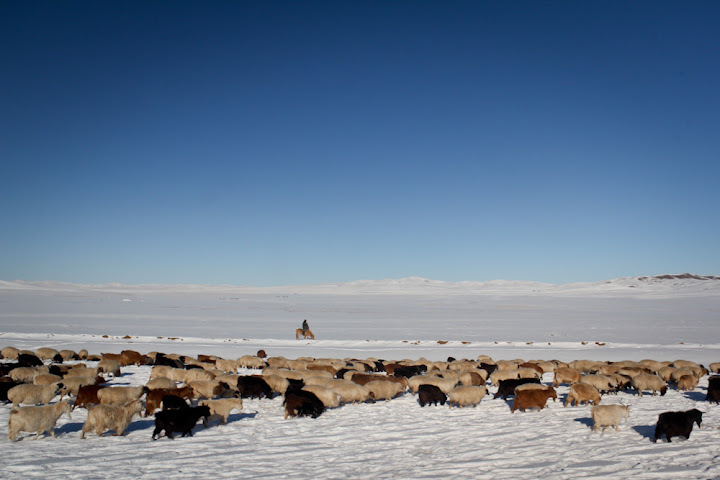 As we made our way to Tsetserlig (Arkhangai’s capital), we passed horse herds, goat herds, cattle herds, and yak herds with dozens of kilometers of nothing in between. I found I was more than content to simply stare out my frosty window, letting my mind wander as we passed over rolling hills. ‘Picturesque’ doesn’t begin to describe the beauty of the Mongolian countryside. Pristine, ancient, crisp, calming, majestic… none of these words really do it justice. This was the scenery that called me back to Mongolia. We visited seven different small business that Mercy Corps funds and supports in different ways. Four of the projects were in Tsetserlig, the province capital where we stayed. Another two were in the ancient capital Kharkhorin, about a 5 hour drive from Ulaanbaatar. The last was in Kharhun and was the most difficult to reach. We left Tsetserlig for the tiny town of Kharhun around 10 AM and drove on paved roads (a luxury here) for about 30 minutes before veering off onto what more closely resembled tire tracks in snow than any sort of real road. From what I gathered, our directions were some version of “keep going straight, cross the mountains, you’ll get there eventually”. And 3.5 hours later, we did get there. Kharhun is essentially a county seat – a small government center with a population of only a couple hundred. Still, compared to the isolation that surrounds it, arriving at our destination felt like we were definitely entering a significant population center. We got out of the SUV, stretched our legs and introduced ourselves to the owner of a felt-making operation and his wife, sons, and employees. 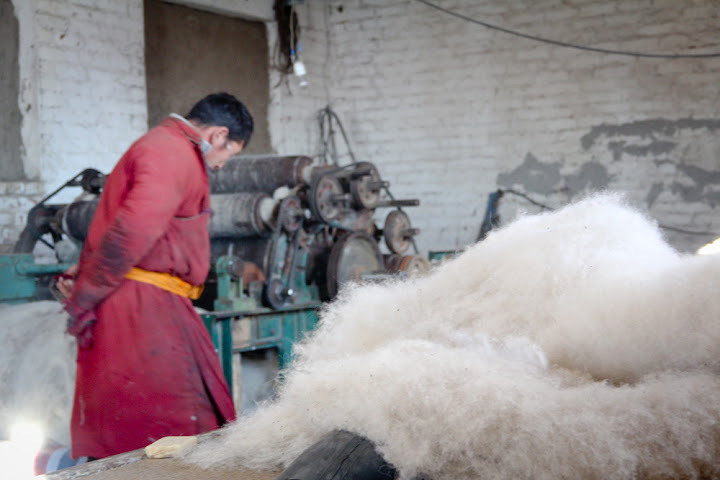 He showed us around the property and demonstrated the equipment that helps turn wool into felt. He sells 300 felt blankets used for the shell of the Mongolian ger (or yurt) annually. We were checking out some new equipment that allows him to produce felt in the winter, a time when he was previously idle. After the demonstration and a brief interview, his wife prepared a lunch of mutton, boiled potatoes, milk tea and bread for us – a warm and welcome meal after the journey. After a few hours with the ger felt-maker and his family, we thanked them for their hospitality and raced the sun as we headed back to Tsetserlig. The next day we visited projects around Tsetserlig, a city of about 20,000. We spent time with a baker, carpenter, masseuse, and members of a sewing coop – all using modest grants to improve or expand their businesses. I could only catch bits of what each of the business leaders were saying about their livelihood (the interviews were all done in Mongolian). The final day, we stopped in Kharkhorin on our way back to Ulaanbaatar to visit a milk producer and felt handicraft cooperative. All very typical and practical Mongolian businesses. I was surprised to learn that the felt handicraft cooperative was the very same that made felt items sold in my favorite shop in Ulaanbaatar. I’ve been eying slippers and felt coasters for a few weeks, knowing they’ll make excellent Christmas presents. Returning to Ulaanbaatar after four days away felt both shocking and slightly relieving. Shocking because the crazed and hectic city has never felt more so. 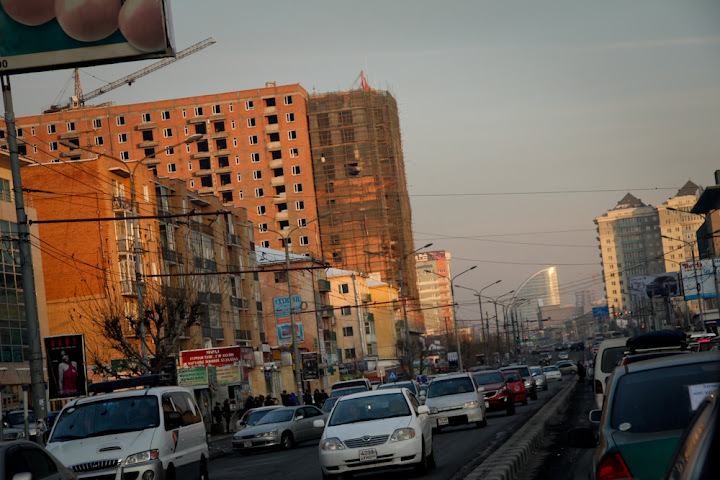 When compared to the quiet and still of the countryside, Ulaanbaatar’s overcrowded streets, orchestra of car horns, brown haze, and bustling citizens are jarring. Still, I felt a sense of relief to be coming back to a city I’m beginning to know. I have friends here now. I know my way around. Ulaanbaatar is indeed becoming my home away from home. great post – thanks for sharing. The photos are terrific – looks like a vast, desolate, potentially dangerous, beautiful place. Be careful on your trips out of UB! Thanks, Lauren. Looks amazing. Keep writing! 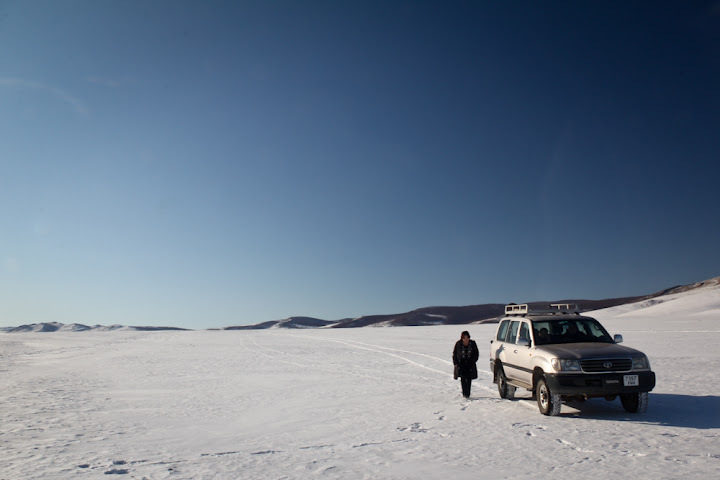 My friend, Nate McCray, went rabbit hunting outside Ulaan Batar last winter (or maybe the previous). They used eagles to catch them! What a place! I will have to add rabbit hunting with eagles to my to-do list! felt factory ….. pretty colors …… Christmas gifts …… hmmmmm .